Another blustery winter day here in the city where winter never seems to end. As I look out onto the street from inside our nice warm gallery, I can see the snow falling almost sideways : we are expecting about 10 centimeters and with the wind chill, the temperature feels like -29. Sigh. 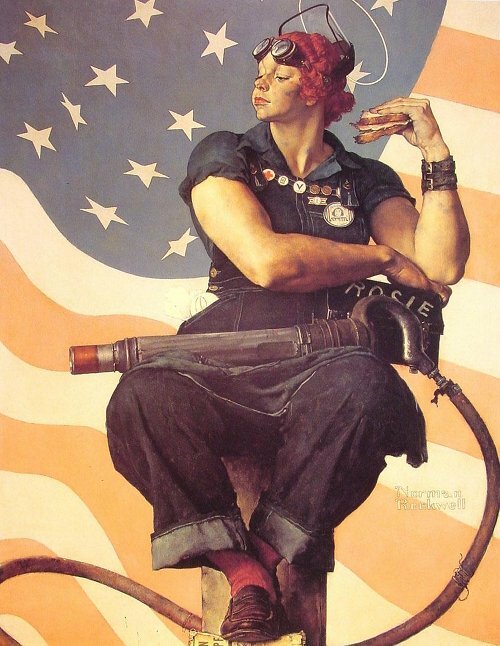 Norman Rockwell – Rosie the Riveter. Although it’s a challenge to brave the roads and get to work, I have to say that I truly enjoy what I do and who I do it with. (I’m talking about work here – minds out of the gutter please.) I thought I might take the opportunity to introduce you to some of the people who make up the L’affichiste team, because although I was alone when I opened the gallery almost years ago, I am now fortunate enough to surround myself with a team of poster-crazy young women. Kristina Lamarre is the gallery director. She comes to L’Affichiste with an enormous amount of retail background, an interest and knowledge of art and art history, and an engaging and infectious good humor. She is diligent, detail oriented, beautiful (inside and out, as they say), and a pleasure to work with. She makes my job infinitely easier and I am so pleased that she found us. Kristina is one of a handful of people who have written to me over the years because they have seen this blog and been intrigued enough to want to work at L’Affichiste. I can’t remember what life was like before Kristina … she’s that good! (My son Giulian has told her that if she ever considers leaving, for any reason, there will be hell to pay.) Kristina is the backbone of L’Affichiste: she keeps me in line, tries to keep us on budget, and unfailingly does both of those things well and with panache. Victoria Byron – who left us just yesterday – was the inventory Queen. Victoria took us from lists on backs of envelopes to a master inventory system which she helped design and which was her baby. She is one of the most quietly capable women I know. Very little phases her, and in an emergency, she’s the one to have on hand. Victoria is a full time student in graphic design and we were fortunate to have her for as long as we did. To replace her, we needed to hire two people! Florence Chevallier is helping us out on a part-time basis both in-store as well as with our French website. Translating 3000+ items into French is no easy task, but Florence is managing to get through the list in record time. She’s also in school and so only here on weekends, but we look forward to her good humor, her fabulous Parisian accent, and her charm. Previous Riding off into the sunset!